There are 1 cat videos tagged with curious. 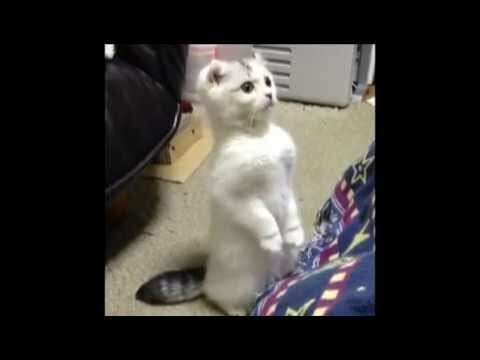 Scottish Fold Kitten Stands On Two Legs! Is it a mouse? Is it a laser light? Is it a lifetime supply of kitty chow? Is it a new toy? Whatever it is, something has sure got this cute kitten's attention. Cats are known to be curious creatures and the adorable facial expressions they make when their curiosity gets piqued are some of the most precious images you can find on the web. This cute kitten is so enthralled by what she sees that she turns into a mini human and stands on to legs trying to get a better look. She ignores the chuckles and giggles of her owner and forgets about the camera adding on ten pounds of fluff—all she wants is whatever is up there, just out of reach. This video has is all—suspense, mystery, and a healthy dose of cuteness. What more could you ask for in one video?